Aaah. Do you feel that? The slightly cooler weather in the mornings that has the air nipping at your cheek? How about the evenings that are growing shorter and shorter each night, with my children going to bed earlier and earlier to my infinite delight? 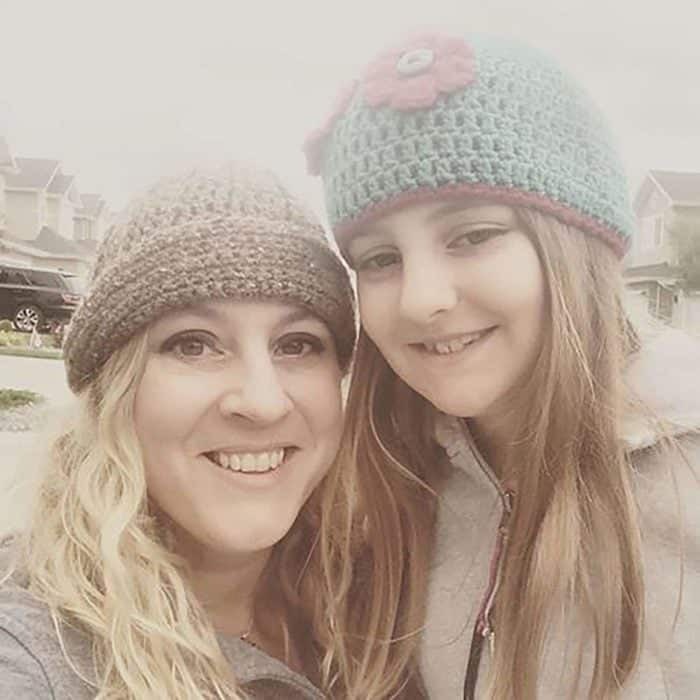 While some of you may be stuck in a heat wave, here in Edmonton this was my daughter and I for a family reunion barbecue on the 15th of August. It’s ok, however, because I love fall and everything that comes with it. I may be a beach loving gal all summer long, but fall is my jam, literally and figuratively. 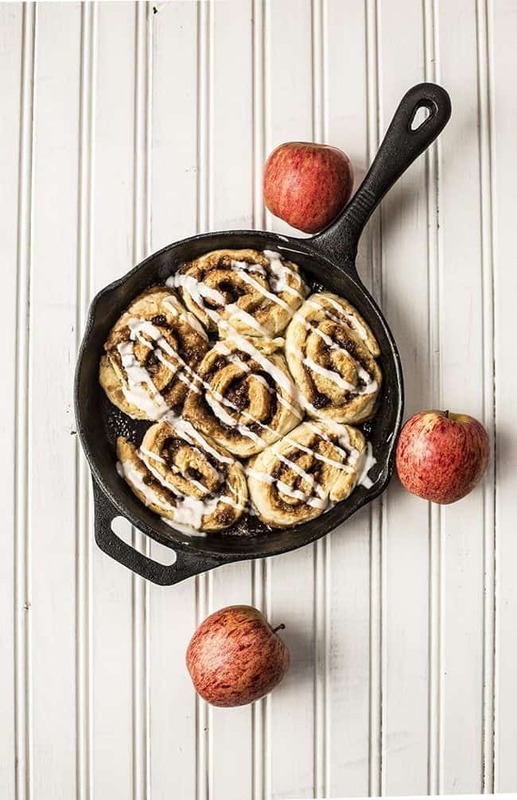 I love baking and cooking in the fall, and one of my favorite ingredients to use is apples. I have my apple tree that I eagerly anticipate the bounty of all year-long and this fall is no exception. I am watching my apple tree like a hawk, waiting for the moment that I can whip up my first apple pie with my very own apples. The inspiration for this apple dish came from the fact that apples and fall go together like back to school and stressed out mom’s. I wanted a very fast, easy and gorgeous dish that you all can make up in a very short time, even on a weekday. Thus my Quickie Skillet Apple Pie Cinnamon Buns were born. These are completely yeast-less and bake up incredibly fast. I also cheat by chopping up my apples and microwaving them to soften them up. Oh, cheater cheater apple eater! These are the easiest cinnamon buns ever, I kid you not. You take your dry ingredients, place them into your mixer, then use the paddle attachment to cut the butter in. Once that’s done, you add the milk, mix again and voila! You have a soft cinnamon bun dough. 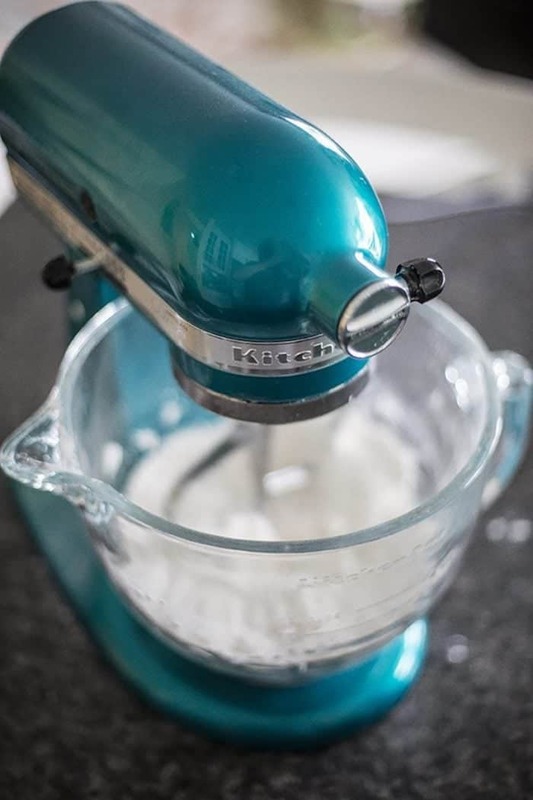 Yes, this is my gorgeous Sea Glass KitchenAid Stand Mixer in action. My candy apple red one is sitting on the counter a little jealous that her sister gets all the attention, but hey, I think the youngest deserves some attention as well. The dough will take you literal seconds, the filling a few minutes more. The dough is rolled into a 12×10 rectangle, then a brown sugar spice filling placed on top. Then you add raisins and steamed chopped apples on top. 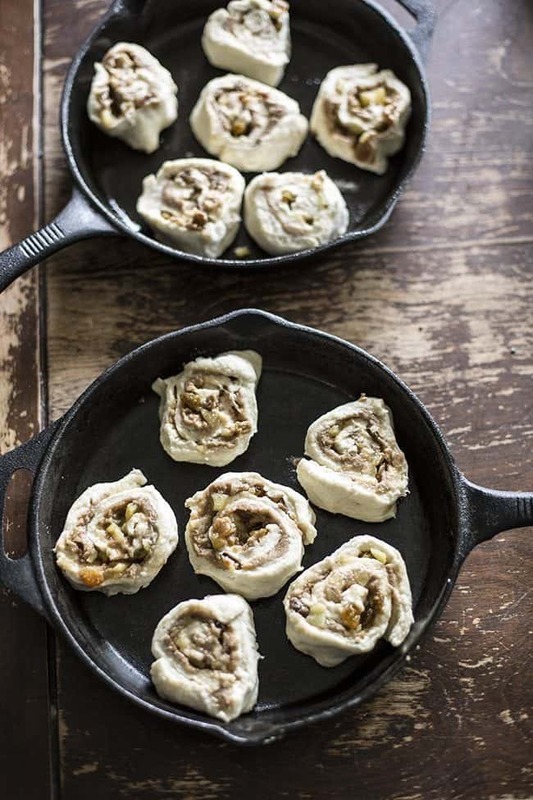 Roll the dough into a log, slice into twelve “buns” and then place into a well oiled cast iron skillet. Bake at 400 °F for 15-18 minutes until the buns are beautifully browned like shown below. 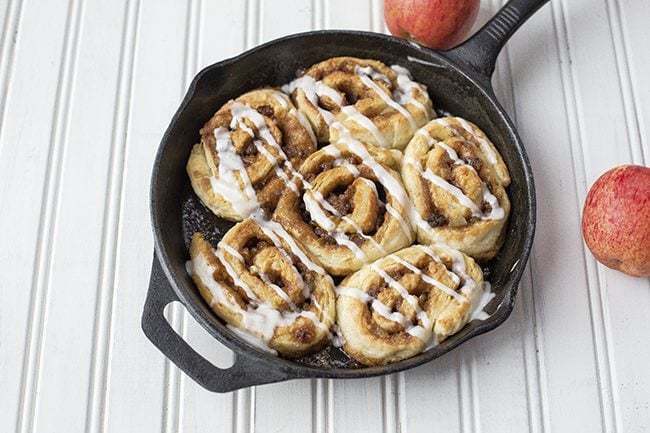 These apple pie cinnamon buns are so easy that you will be making them all the time! Whisk together the dry ingredients. Cut in the butter until it's the size of small peas. Mix in the milk until the dough forms a ball.Turn out the dough onto light floured surface and roll into 12 x 8 inch rectangle. Combine the first three topping ingredients and spread them onto the dough. 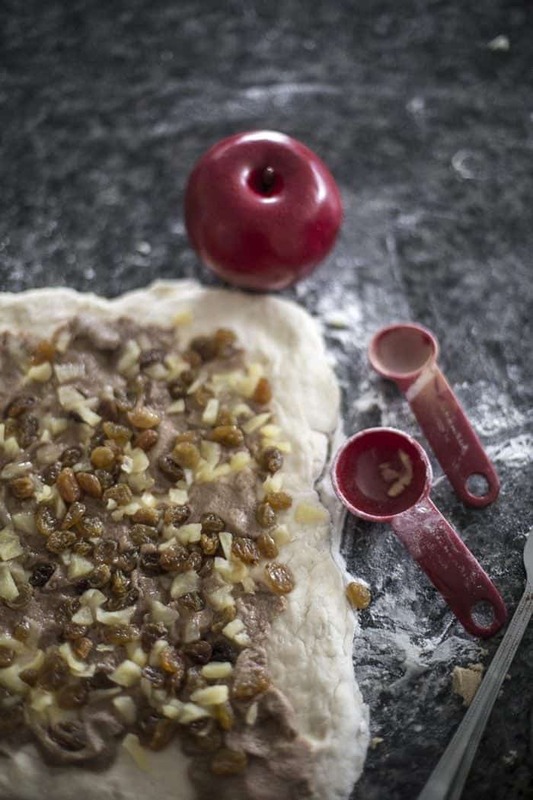 Sprinkle the raisins and apples over the top and then roll up the dough jelly-roll style. Cut into 12 even pieces. Place into greased muffin cups and bake at 400 until the rolls are browned and the cinnamon mixture is bubbling, approximately 15-20 minutes.Cool slightly, then remove from the tins.Whisk together glaze ingredients until smooth, then drizzle over the top of the buns. Serve and enjoy! oops I didn’t realize this would be public and you delete my email address? Will these be in your new cookbook? Ok…great..at least I have the link! 🙂 I can’t wait to get your book! The recipe code got wiped somehow, thanks for finding that! It’s all up! I don’t see the link for the recipe on the website.